Summer fruits are in abundance now at the Farmers Markets. 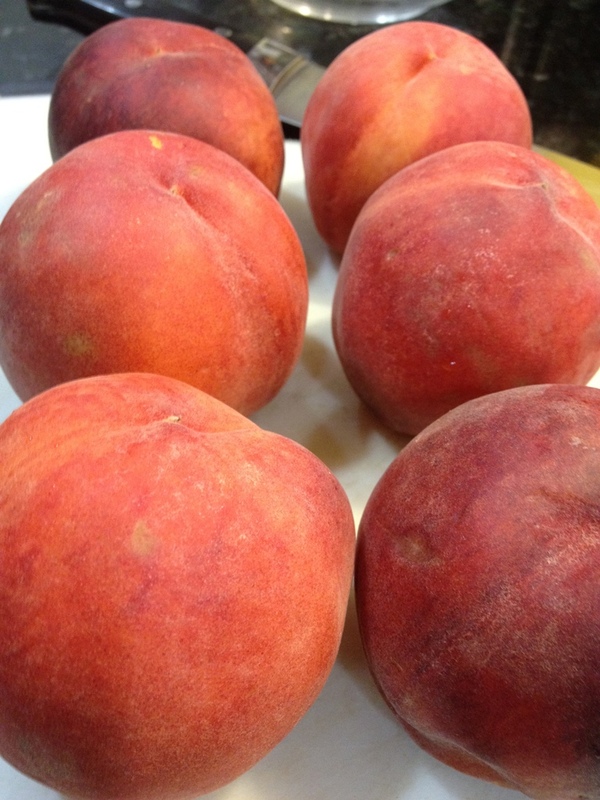 My personal love is berries, but heavy, warm, fresh peaches are a close second! Here is a fun and unusual twist on a traditional peach pie that combines three of my favorite things: peaches, honey and homemade ricotta! To go with summer picnics or BBQ’s, I made these small individual size pies. Serve with a scoop of vanilla bean ice cream and you’ve got the perfect little sweet treat! If you make all the ingredients yourself (minus growing the peaches – unless you have a tree, in which case, see the contact tab on my page and feel free to send me a box!) 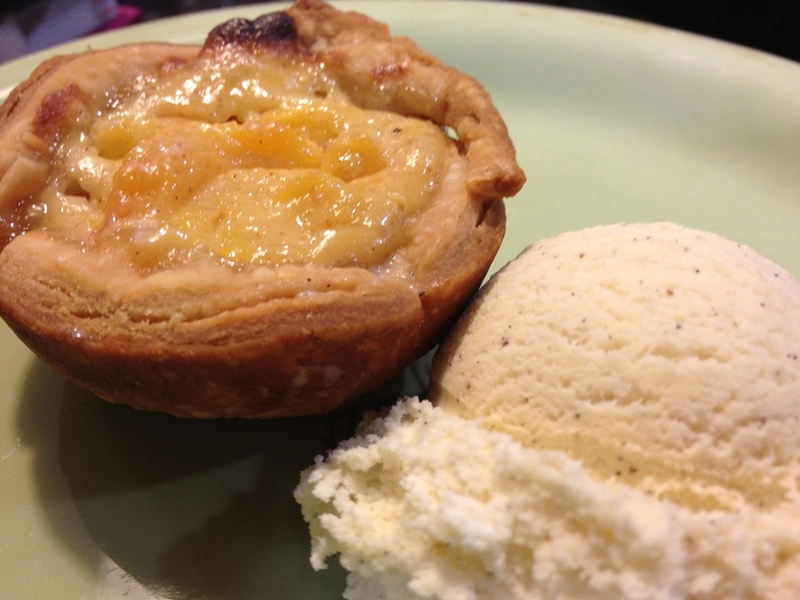 these little pies can be a bit labor intensive, but they are well worth it! Go ahead! Pull out your favorite 12 cup muffin tin and let’s get started! 1) Place the dry ingredients in a food processor and pulse 4 or 5 times. 2) Add the butter and pulse just until small pebbles form. 3) Add the ice water and pulse just until a crumbly dough comes together. If needed, add 1 tbsp of water at a time until the dough forms. 4) Remove from the food processor (carefully) ! and form a flat disc. Wrap in plastic and refrigerate for 1 hour (or 20 minutes in the freezer). 5) Roll your dough in a shape 2” larger than your pie pan. Using the rolling-pin, pick up and gently lay the dough into the pan. Cut, crimp or use the tines of a fork to create a decorative edge. 6)Bake blind (with pie weights and no filling) at 375º until golden on the edges, or fill according to your favorite recipe and follow its instructions. For these mini-pies, roll out the dough in 12 (six-inch diameter) circles. Gently press a dough circle into each well of the muffin tin. Put a cupcake liner INSIDE each dough circle and fill with enough rice to cover the bottom. Blind bake at 375 degrees for 10 minutes or until golden on the edges. 4 medium size peaches, cut into 1-inch pieces. Leave the skin ON! Set aside 1/4 cup for garnish! 1 1/2 cups ricotta cheese – follow the link and make your own! 5 TBLS honey, plus more for drizzling! Whip cream or vanilla bean ice cream for topping! In a large bowl, combine cut peaches and ricotta. In a medium bowl, lightly whisk the egg, then add the spices, vanilla, sugar, honey and salt. Combine the egg mixture over the peach and ricotta mixture, and stir to combine thoroughly. Divide the filling evenly among the pie shells. Bake for about 25 minutes, or until the top is golden brown. Cool. Top with whip cream, remaining peach pieces and drizzle with extra honey! I really have to make these again, if for no other reason than to get better pictures! These were gone so quickly there was hardly time to snap pictures! (I guess that means they must have been good!) For now you’ll have to take my word on how wonderful they taste! Better yet, give them a try yourself and let me know what you think! Until next time! Enjoy my friends!